Modafinil is being used as a nootropic drug that increases alertness and gives a sense of well being — to some users. Like most drugs, individual results seem to vary. One reason for the variation is a common genetic variation in the COMT gene. Modafinil is a prescription medication (in the US) for decreasing daytime drowsiness in narcolepsy patients. Off-label, it is a popular drug for neuroenhancement. Does it work? Clinical trials have shown that it is effective for cognitive enhancement, but the trials didn’t differentiate between genotypes and show a range of effectiveness. Modafinil is thought to work by increasing dopaminergic neurotransmission, which depends on the activity of the gene, COMT (catechol-O-methyltransferase). COMT is the enzyme that breaks down neurotransmitters (including dopamine, epinephrine, and norepinephrine), and the rate at which it metabolizes the neurotransmitters affects their levels in the brain. When investigating modafinil’s effectiveness in people with different genotypes, research results showed that those with the COMT Val/Val genotype had a much better response than those with the Met/Met genotype in terms of sustained vigilant attention. In fact, the study says that modafinil “was hardly effective in subjects with the Met/Met genotype”. 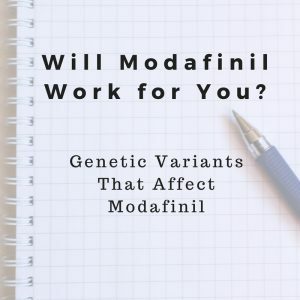 For both genotypes, modafinil worked in keeping the subjects from feeling sleepy, so the difference in genotype was on the cognitive benefits rather than wakefulness. If you’ve ever tried modafinil and wonder why it didn’t have much of an effect on you, perhaps the reason is in your genes. I’m not going to weigh in on whether or not you should take modafinil… or where to buy it. You can go read about it on Reddit for that type of info. If you have histamine intolerance, mast cell problems, or anorexia, please note that modafinil may increase histamine levels in the brain. If you are wondering about the metabolism of other drugs, I suggest starting with checking your phase I detoxification genes (CYP450’s) through my Phase I Detox report or by reading about it here. This is a good look at COMT and modafinil. I would add that, like everything in genetics and biology, it’s complicated. Two examples are that COMT works by methylation, so its function will be diminished if there is a lack of methyl groups available. Another factor is diet. A diet high in catechols can overwhelm COMT enzymes and green tea, Rhodiola, and quercitin suppress COMT activity. This is a great example of why prescribing drugs and natural compounds in the outmoded manner of X is good for Y should be discarded. 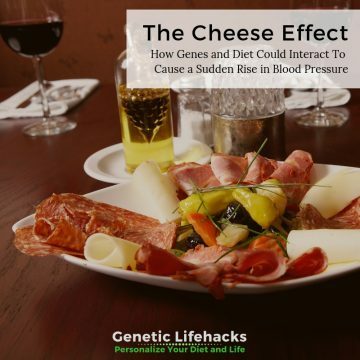 Yes, coffee (as an example) may be beneficial to the majority of people, but because of genetic variations, some will not be affected by it and others harmed. Our knowledge of genetics has opened up a more efficient, personalized way of improving health.